Mets or Cubs? Here’s who you should root for in the MLB playoffs. Who to Root Against in the Playoffs? These playoff teams are all too damn likable! 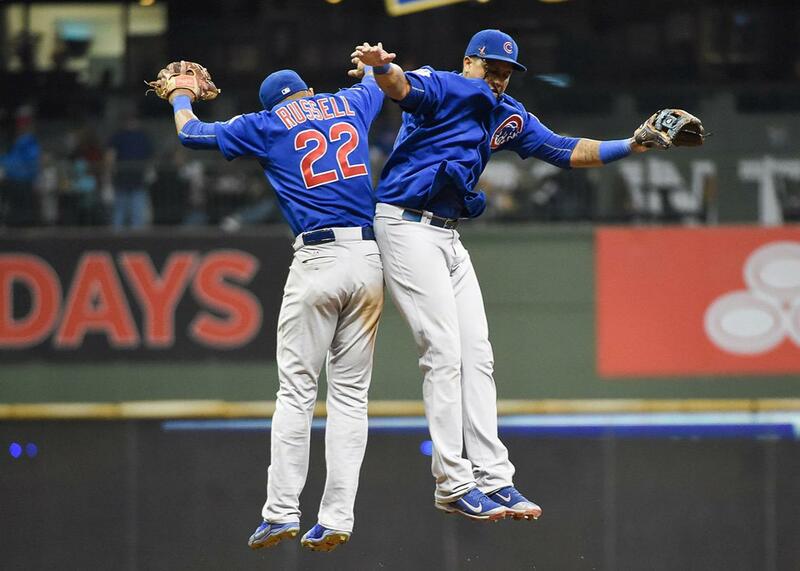 Chicago Cubs shortstop Addison Russell and second baseman Starlin Castro celebrate after the Chicago Cubs defeated the Milwaukee Brewers 6–1 at Miller Park on Oct. 2, 2015. With the penultimate round of the Major League Baseball playoffs getting underway, casual baseball fans are faced with a real dilemma: deciding which team to root against. In the Goofus-and-Gallant binary that defines baseball fandom, likable playoff teams are almost always counterbalanced by loathsome ones: overexposed success-mongers with smug and annoying fan bases. But this year’s League Championship Series is historically short on Goofuses: It’ll be only the second LCS since 1996 in which one or more of the Yankees, Red Sox, or Cardinals have not appeared. The Chicago Cubs, the Toronto Blue Jays, the New York Mets, and the Kansas City Royals make this perhaps one of the most likable crops of League Championship Series teams in baseball history. 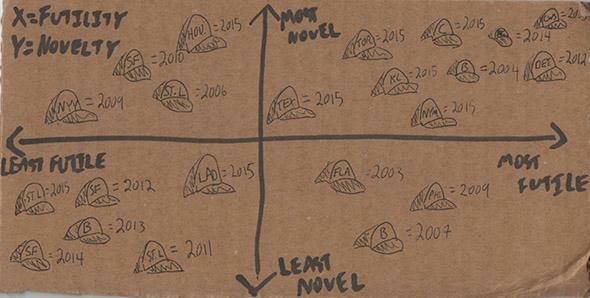 To demonstrate that this year’s LCS teams are among the most likable in recent playoff history, I’ve devised a scientifically accurate, peer-reviewed “likability matrix,” which I have carefully drawn in dry-erase marker on a piece of cardboard. With an x-axis measuring futility—a team’s historical playoff-success record—and a y-axis measuring novelty—how sick we are of hearing about a given team—I’ve charted this year’s LCS entrants alongside some other notable playoff teams of recent vintage. The Matrix tells all. Now that I’ve conclusively proven the historical likability of the 2015 Blue Jays, Cubs, Mets, and Royals, it’s time to ask another important question: Which is the most likable team of this very likable bunch? Let’s take them one by one and find out. Why they are likable: I should preface this by saying that not only am I a big-time Cubs fan, but I also work at Wrigley Field in the summers as a beer vendor. So you should probably adjust for possible authorial bias when I tell you that the 2015 Cubs are the most likable team in the history of baseball. The Cubs’ futility factor is off the charts: The team hasn’t won a World Series since 1908 and hasn’t even appeared in the series since 1945. The intensely likable Joe Maddon manages the team as if he were throwing a seasonlong birthday party: He hired a magician to entertain the team in the clubhouse, brought exotic animals to the stadium so that his players and their families could hold them, and convenes a clubhouse dance party after every victory. The team is filled with enthusiastic rookies who clearly enjoy each other’s company. Finally, for the entire year, the Cubs have rostered a player named Jonathan Herrera, whose main talent seems to be his willingness to sit in the dugout with a Dubble Bubble bucket on his head. And he’s the best damn bucket head in the league. Why they might be loathsome: One of the Cubs’ owners, Todd Ricketts, once appeared on the show Undercover Boss, which is a pretty terrible show. In his segment, Todd Ricketts pretended to be a Wrigley Field hot dog vendor and then threw away several dogs that he couldn’t sell. Not only was this wasteful, it was unnecessary: Just go back to the commissary and return those unsold dogs for a refund, Todd, you dummy! Why they are likable: Yes, the Royals made it to the World Series in 2014. But that one bit of success does not erase the team’s long history of badness. Historically, the Royals probably combine futility and anonymity better than any team in this year’s playoffs—which makes the team’s recent run of success particularly delightful. The team’s core stars are all homegrown. The team boasts the most delightful superfan in all of baseball, a middle-aged South Korean dude named Sung Woo Lee, whose fandom odyssey was recently chronicled in an ESPN 30 for 30 short. Finally, the invaluable website Baseball Reference tells me that the team’s farm director and scouting director are named Ronnie and Lonnie, respectively. Rhyming names are a hallmark of likability! Why they might be loathsome: Pitcher Yordano Ventura is a bit of a hothead, for one thing. Royals owner David Glass used to be president and CEO of Walmart and despite being very wealthy has a history of pinching pennies on team expenditures. I think I once heard a rumor that manager Ned Yost murdered a hobo? I don’t know, guys, I’m reaching here. The Royals are pretty darn likable. Why they might be loathsome: Even though the Mets are far less annoying and garner far less exposure than the Yankees, they’re still a New York team, which gives everyone who doesn’t live in New York ample reason to dislike them. If you need specific reasons to hate the Mets, look no further than their owners, the hapless Wilpon family, which over the past decade or so has lost most of its money in a series of Ponzi schemes. The Wilpons now manage the Mets like a small-market franchise despite playing in the country’s largest market. Why they are likable: The Blue Jays last appeared in the playoffs in 1993, which makes their playoff drought the longest among this year’s finalists. As a man who enjoys snow, the music of Stan Rogers, and disgusting gravy-based foodstuffs, I think Canada is one of the world’s most likable countries. Thus, the Jays’ Canadianity alone ups their likability quotient by at least 10 percent. The team’s pitching staff is particularly likable: Mark Buehrle likes to take rookies on shopping sprees; R.A. Dickey wrote a book and climbed Mount Kilimanjaro; LaTroy Hawkins has an adorable fan club; Marcus Stroman made a miraculously quick recovery from surgery to pitch the lights out in September. Josh Donaldson, Troy Tulowitzki, and José Bautista might be the three most underrated superstars in the game. Finally, Munenori Kawasaki is just a highly entertaining man. Why they might be loathsome: The Blue Jays would be much more likable if they hadn’t traded away rookie pitcher Daniel Norris, known as “Van Man” for his habit of living in his van. Also, when they don’t get their way, the fans have a nasty habit of dumping beer on babies. As we’ve demonstrated, all four of these teams are exceedingly likeable. However, the gods of baseball demand that you can root for only one team. If we look closely at the scientific Likeability Matrix, it’s clear: Go Cubbies!